Professor Aniket Bhagwat is a third generation landscape architect practising in Ahmedabad with m/s Prabhaker B Bhagwat and manages the landscaping for Palava. A stimulating writer, thinker and academician, he co-edits and writes for SPADE, a chronicle on design research. Cities have always been, and are even today, engines of growth. They attract a rising tide of people that hope for a better life for themselves and their future generations. Palava, the Greenfield smart city, has been envisioned to be amongst the 50 most livable places in the world by 2025. The success of smart cities lies in their sustainability and thus Palava endeavours to be a ‘sustainable’ city and have its characteristics designed in accordance to achieve that vision. A ‘sustainable city’ is also known as an ‘eco-city’, which means it is designed in consideration of environmental impact to ensure that with its high-density, walkable urban fabric, focus on public transport, significant recycling and significant amounts of landscaping, it has the lowest levels of per capita carbon emission globally. Palava has been carefully planned to incorporate the essential principles of eco-friendly liveability. The city’s green landscape has been designed to preserve the indigenous flora and create a balance of all strata’s of vegetation that contribute to the diversity of the aesthetics of the city. Preserving the mandate of building a city without disrupting its natural surroundings, the developments have been planned such that they do not disturb the natural surface hydrology, there is no cutting of the rock strata nor is there any disturbance to the natural gradient. The topography of the city’s green spaces focuses on environmental improvement and enhancement of natural resources such as bettering the topsoil quality, preserving existing trees and valuing the natural river, lake and swale that form natural landmarks along with the grasslands and rocky outcrops. 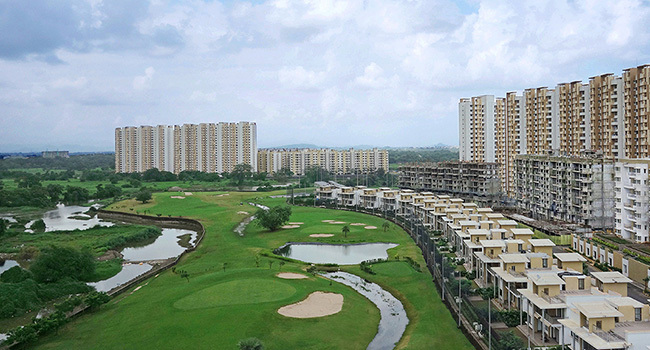 Palava’s land was always dotted with trees and the planning strategy ensured that all those trees were untouched or transplanted, as best suited, to fulfill design requirements of the open greens within the master plan. The plantation palette was carefully chosen after taking into consideration the land topography and its soil. Understanding that planting new saplings would need several years to grow and provide the much-needed benefits, we set up a nursery at Posari, a village close to Palava, well in advance, to grow trees that are presently being used across the city. The trees are procured and nurtured for their growth and health and thereafter planted around the city to enhance its green cover. Phase I presently has over 21,000 trees while Phase II is planned to have over 1,00,000 trees. While designing the open green space, the focus remains to strengthen the existing greens and nurturing the present environs to create a healthy experience for the citizens. And the recently held Go Green initiative, undertaken by the Palava City Management Association with support from the citizens reaffirmed our line of thought, as they came together to plant over 5,000 saplings across different neighbourhoods. The parks, waterfronts and community greens in the city are designed to provide a diverse experience to the sensory palette. While the lake is 5 times the size of the Banganga Tank, the riverfront stretches up to 2.4 km, which is thrice the distance of Girgaum Chowpatty. Today, Palava’s ratio of open spaces accounts to 2.5 sq.m./person as compared to 1.1 sq.m./person in Mumbai. The masterplan is also designed keeping in focus walkability, having basic amenities such as schools, clubs, retail and parks within a 5 minutes walking distance. Therefore, pavements are well shaded and equipped with essential signages, benches and bins. Aiming to encourage a car-free environment and reduce pollution due to gas combustion, the city has dedicated bicycle tracks to ride through its neighbourhoods. While at the macro level, the present design and proposed development is well aligned with the existing natural elements and planning flexibilities, at a micro level, it focuses on the citizen’s aspirations and needs. In all, the landscape design of the Palava tries to create opportunities with a diverse range of programs within a cohesive master plan that is primarily essential to improve the quality of urban living.